Incredible curb appeal and an impressive variety of small businesses contribute to the unique character of Carroll Gardens. This neighborhood got its name, in part, from the gardens planted between the sidewalk and the deep setback of the mostly 3 story homes. In the late 1800s, a law was passed stating that all homes in a large section of Carroll Gardens must have a front courtyard. Carroll Gardens’ tight knit community is dedicated to preserving its various cultural identities. There are strong Italian, French, Irish, and Norwegian communities. These cultures are celebrated by the entire neighborhood. A Bastille Day party and accompanying pétanque tournament close Smith Street every year. Along Court Street are generations-old cobblers, delis, Italian butcher shops, and European bakeries. While supporting its heritage, the Carroll Gardens’ thriving, diverse small business scene also embraces the trendy and fashionable. It’s a hotbed of indie clothing boutiques, artist collectives, and lots to do. The numerous acclaimed restaurants on Smith St. have earned it the nickname “Brooklyn’s Restaurant Row”. Cocktail bar Brooklyn Social and craft beer bar Bar Great Harry are among the inviting selection of casual nighttime options. The best microbrewery in New York, Other Half, crafts delicious beers that can be sampled in it’s popular tasting room. A short stroll to the surrounding neighborhoods of Cobble Hill and Gowanus affords an even wider range of possibilities. The bocce courts, playground, and free Wi-Fi at Carroll Park make it a popular gathering place. There are also a few small community gardens sprinkled throughout the neighborhood. The Carroll Gardens branch of the Brooklyn Public Library is very much a part of the community, offering readings, after school programs, and outstanding cultural events. 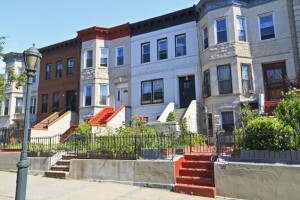 While much of Carroll Gardens remains single family or subdivided brownstones and row houses, new developments are cropping up in some areas in step with the neighborhood’s growing appeal. Prices here are somewhat lower than the average for Brooklyn.